The Limitorque MX and QX series electric actuators supplied by Acrodyne already offer a host of features and functions to meet today’s and tomorrow’s requirements relating to actuator technology. The Limitorque MXa actuator can be further enhanced with options such as Tamper Proof Covers, Aunspach Torque limiters and Extension spindles. 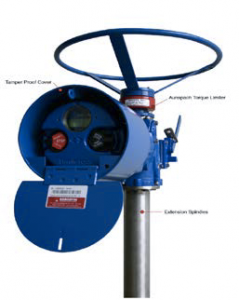 The Acrodyne Tamper Proof Cover provides a secure method of protecting the local control station on Limitorque MX and QX series electric actuators. The cover fits over the existing local control station and is easily secured to the actuator housing. It provides complete protection of the local control switches, local indication station and indicating LEDs and acts as a deterrent to possible interference or vandalism. The Tamper Proof Cover is made from 4mm stainless steel and is powder coated to match the actuator. It includes a hinged stainless steel lid, manoeuvrable via the integral lift handle, reducing the risk of losing or damaging components when access to the actuator controls is required. The cover is secured utilising up to a 10mm diameter clasp padlock. To complement the Tamper Proof Cover is a stainless steel declutch lever locking device securing the actuator against un-authorised manual operation. Torque limiting is typically controlled by the actuator only when it is in motorised mode. However, when the actuator is in manual mode using the hand wheel there is no mechanical torque protection provided. The inclusion of an Aunspach torque limiter between the hand wheel and the actuator drive sleeve eliminates costly valve or gearbox damage. This is a relatively low cost inclusion when compared to the inconvenience of costly downtime and valve repair or replacement. Extension spindles are commonly used to provide a suitable operating height for the actuator. The extension spindle is typically fitted between the actuator mounting base and valve or gearbox input shaft flange. Extension spindles are widely used on buried service valves. Acrodyne can custom manufacture extension spindles to any length, any size in materials up to grade 316 Stainless Steel. Acrodyne’s fully equipped workshop can machine, fabricate and paint to your specification.